These pics show the need to know a little about other trades, as well as your own. I used to work for a company here that specialised in installing AirCon/HVAC equipment and the majority of our systems worked off of a Pressure switch. Running a thermostat wire inside the same conduit as the Mains wiring sounds a little dangerous, considering that the T/Stat wire is often very lightly insulated, to say the least. 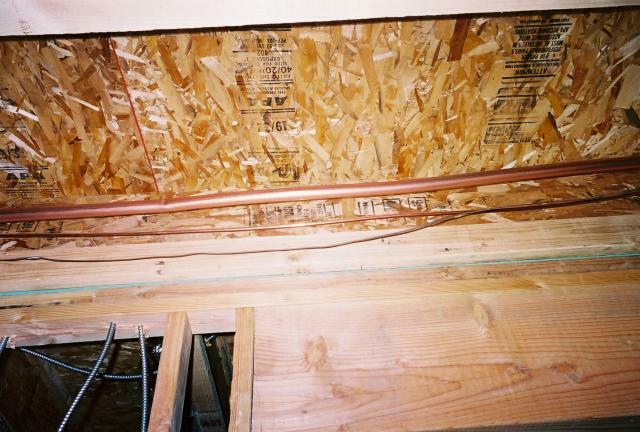 Speaking of insulation, were these pictures taken before the HVAC guy had a chance to insulate his pipe-work?. Often the liquid (smaller) line would go un-insulated here. I was hooking up the power to a new house recently where the Building Inspector refused to sign-off the Building Completion Notice until there was insulation on the Gas (larger) pipe of the AC system. Un-insulated pipes like this cause water problems from dripping Condensation. One must start the day early to slip one past Trumpy! Yes, I took the pic before the insulation was added, so you could see the wire. NEC does ban running "power limited" circuits in the same raceway as power cables- so running the t-stat wire together with the power leads is a violation. The whole point of my pic is to show your average non-HVAC person that the t-stat wires are often run separate from the power, even though they may not be visible without taking things apart. 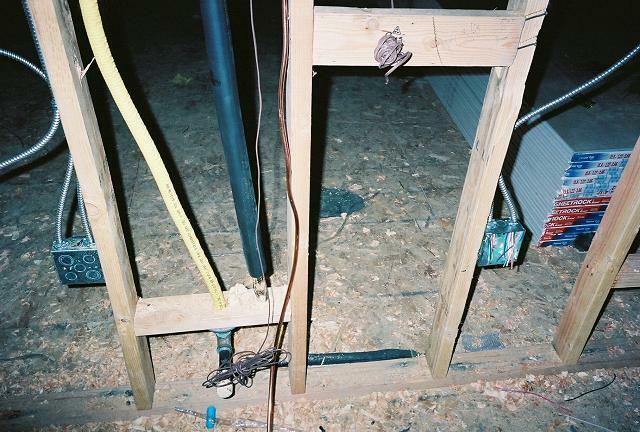 Likewise, most electricians are not aware that some systems don't even have a cable run to the condenser (outside unit). Who was that idiot that nailed that dwang (Horizontal timber piece) in to hold the T-stat wire, in the top pic?. Looks like the nail-gun completely missed as did the person fitting the dwang. That fine bit of "carpentry" was done by the HVAC guy. The sheet-rockers are going to love that little piece of artistry. Looks like the stud split, on the right, where Mr. HVAC added his 2x4. Just proves anybody can be an electrician if they get hte right matchbook cover! Here in NJ a lot of HVAC people have EC's working for them. A lic. EC will sign all the permits and hopefully do the electric work. Are you tastefully implying something ??? "A lic. EC will sign all the permits and hopefully do the electric"